One of my favorite ways to prepare scallops is to coat them with seasoned bread crumbs, drizzle on some olive oil, and roast them in the oven for less than 10 minutes. A sprinkle of lemon juice provides the finishing touches. I’ve served them just like that or over linguine, but always use leftovers on salad. 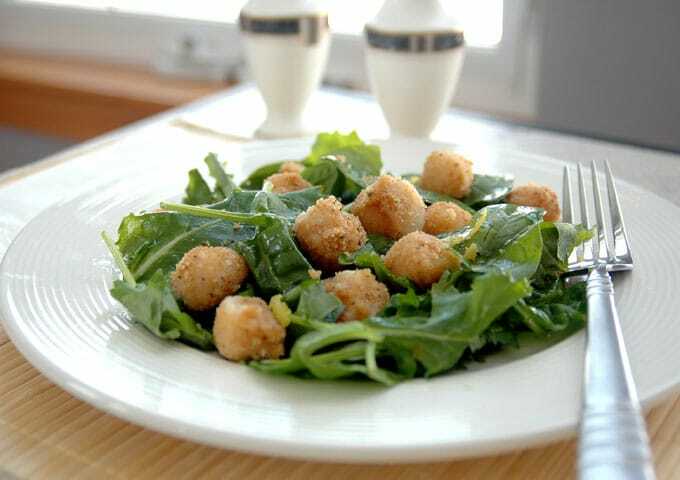 This time, I went straight for the lettuce, so here’s my recipe for Easy Breaded Scallops over Salad with Lemon Vinaigrette. Including the time it takes to wash the scallops, we’re talking about a 15-minute meal. And, if I may say so, it’s a fabulous dish with glorious simplicity. You don’t need to dip the scallops in anything first, because the water that clings to them after washing will help the bread crumbs adhere. It’s best to use dry, Italian-seasoned crumbs here, and either homemade or store-bought will work. If you use my Homemade Italian Bread Crumbs, don’t add any cheese. The result is a bright, refreshing, delicious salad bursting with Mediterranean flavors. You can make a meal of this with some nice rolls and fresh fruit on the side. And since this is light and healthy, you needn’t feel guilty about having cheesecake for dessert, if such a thing would ever occur to you. I’m just saying, (as I wipe dessert crumbs from my face). 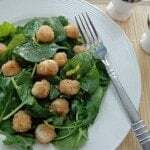 A gloriously simple and healthy 15-minute meal, Easy Breaded Scallops over Salad with Lemon Vinaigrette features delicious, bright, Mediterranean flavors. Preheat the oven to 400 degrees F. Grease a rimmed baking sheet with a bit of olive oil. In a fine mesh strainer, rinse the scallops under cold water, being careful to remove any specks of sand by gently scraping them off with a brush or your nail. It's important to closely examine each scallop to look for sand. Transfer the drained scallops to a small mixing bowl and pour the bread crumbs over them. Shake the bowl a bit to distribute the bread crumbs so they cling to the scallops. Use your hands to gently mix them if necessary. Place the breaded scallops in a single layer on the baking sheet, drizzle on the tablespoon of olive oil and bake them for about 8 minutes. (Check them after 5 minutes, cutting one open to see if it's almost done.) The scallops are done when the center is no longer pink and shiny, but is white. Be careful not to overcook them, or they will become tough and rubbery. 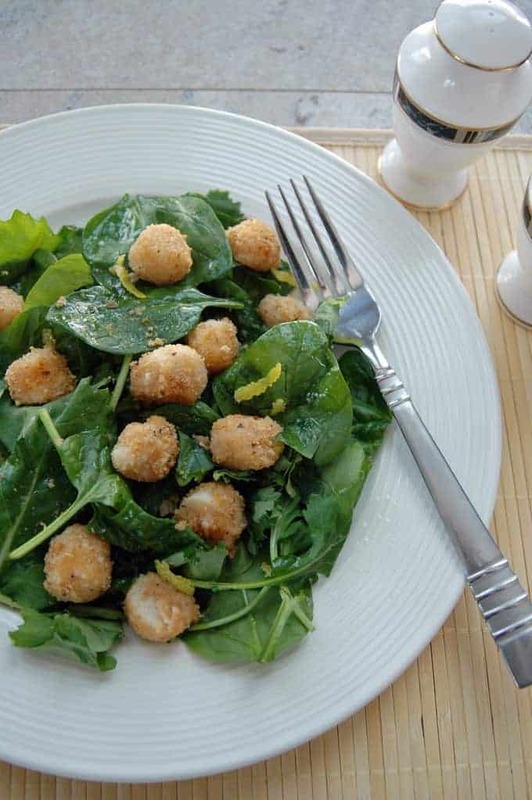 While the scallops are cooking, make your lemon vinaigrette. Whisk the olive oil, lemon juice, vinegar and salt in a small bowl. Use a lemon zester or vegetable peeler to scrape thin ribbons of lemon zest from the lemons. 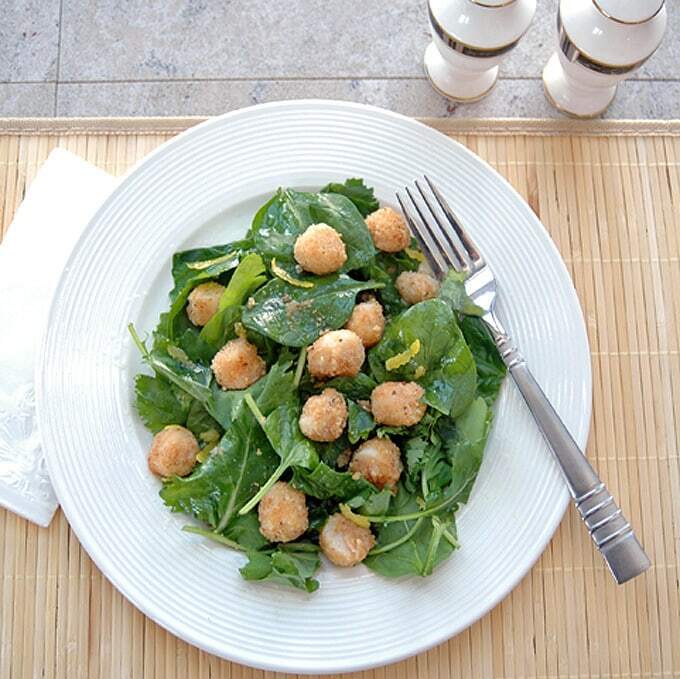 To serve, plate the lettuce and top with scallops, dressing and lemon zest. Store any leftover scallops in the refrigerator for up to three days. If using large sea scallops, you can speed up the cooking time by heating the oven to at least 425 degrees F (or 450 degrees F.) Check the scallops after five minutes, cutting one open to gauge how much time is still needed to cook them. Gently toss them with a spoon if needed, and continue cooking them for a couple extra minutes at a time, checking after each interval.They're ready when the centers are white but still tender. I would never have thought to bread scallops, what a great idea! This looks like such a simple and delicious salad…my kind of food! Breading the scallops is my go-to way of preparing them, because it’s just so easy and tasty. 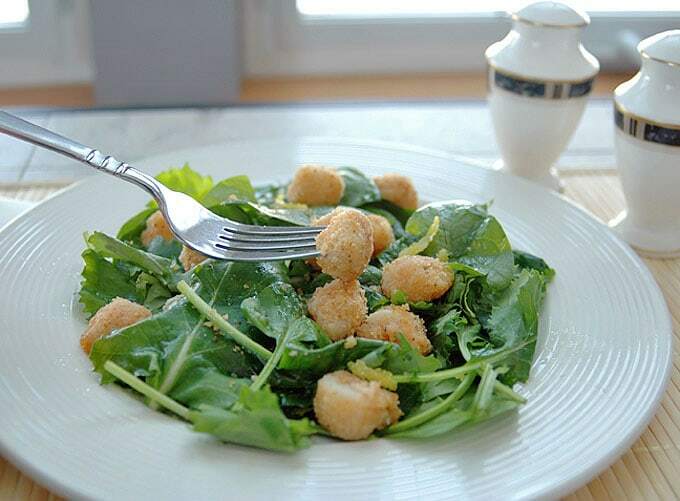 I know you love salads, Denise, and hope you give this one a try! Oh how I love Seafood, let me count the ways…I just posted on TK- Oyster Stew, Crab Bisque Soup and I forget what else. Love Seafood but you already know that! HA! I don’t think I’ve ever tried oysters. I’m a seafood lover too, though, so I’ll have to check out your recipes! Hi Andrea, the other one is Crab and Sea Scallop au Gratin. I may have way too much going on at the moment especially when I can not remember what recipes I submitted to TK that posted. HA! Anyway I love bay scallops too. Hoping you are having a good week and that the weather is warming up to melt all that snow!!! Thanks, Cheryl. They all sound delish! I saved them to my recipe box. 🙂 The snow is thawing, and it rained today, so it’s a bit warmer but kind of foggy. I adore scallops. This is one delicious recipe, how creative!!! I hope you try it sometime, Kathy! Those lemon peels look like they take this right over the top! I never understood adding zest or peels to dishes until I read somewhere that they add more lemon flavor without the sourness/acidity of adding more lemon juice. So brilliant! I guess technically the ribbons are still called zest if there’s no white pith (I just corrected that in my post), but you’re absolutely right that they add flavor without bitterness. Now, I want to add them to everything, lol! This looks wonderful and you’re right, so simple. I’m always a little afraid to cook scallops for fear I’ll under or over cook them but you make it sound super easy!